The House and Library at Sichów is situated in an 18th Century Manor House resting in the countryside of Poland. It is an educational centre dedicated to language and the arts. Our environment inspires creativity and thought-provoking conversation, fireside chats. Sichów captivates its visitor with its tall trees and peaceful atmosphere. Here, our guests step back in time to an era when the pace of life was slower; when there was time to keep a diary, to read, to nap, and to make art. We invite you to join us for the 2018 “Bring Your Canvas” to Poland Stitch Fest for a week of immersion in Polish craft culture and to work on your needlepoint. Dodie Jackson, accomplished needlepoint teacher, will be with us to help with your project. Guests arrive at Krakow airport where they will be met by their host. Guests will be escorted to The Bonerowski Palace in the Old Town Square. Welcome reception at 6:30 p.m. followed by dinner at the hotel. After breakfast at the hotel, we will walk through the Old Town Square to Wawel Castle where we will be greeted by our personal tour guide. The textiles and tapestries dating from the 15th Century will be included in this tour as will the Painting Collection which includes Dutch, Italian and Polish works. Free afternoon to lunch, shop, and sight see. Meet in the hotel reception area at 4:00 p.m. From there we will take a short walk to visit our family home in Krakow, a medieval Palazzo restored to museum standards. We will enjoy afternoon tea and then return to the hotel for 7:00 p.m. for a private piano concert. 8:00 Dinner on your own. After breakfast at the hotel, we will visit the Jozef Mehoffer House and Museum. Mehoffer was the National Portrait Artist of Poland up to his death in 1946, and a family friend who often visited Sichow. We will also visit the famous 15th Century altar at St. Mary’s Basilica. Free afternoon to lunch, shop and sightsee. 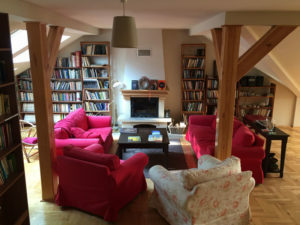 Dinner at Cyrano de Bergerac at 7:00 p.m.
After breakfast at the hotel, we will meet in the hotel reception area at 11:00 a.m. where transportation will drive us to the House and Library at Sichow. Lunch at Sichow upon arrival. Free afternoon to explore the Palace grounds or work on canvas. Welcome Reception at 6:30 p.m.
After dinner, we will have a piano concert in the Music Salon. Breakfast at Sichów. 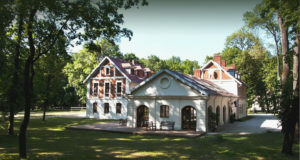 At 9:30 a.m. we will leave for the Castle Museum at Lańcut where we will take a tour and enjoy lunch on the grounds. We will return to Sichów late afternoon to rest. After dinner, choose the fireplace upstairs or downstairs to sip wine and work on canvases. Free morning to needlepoint or rest and read. After lunch, we will leave for the hilltop village of Sandomierz where we will visit the Diocesan Museum established by Jan Długosz, the most renowned historian of Mediaeval Poland. Here we will see a collection of chasubles made from 16th/17th Century Persian and Turkish fabrics. Also, on our walk is, the Cathedral Basilica of the Nativity of the Blessed Virgin Mary, a gothic cathedral constructed in 1360. Return to Sichów late afternoon to rest. 8:30 p.m. Traditional Polish Music, ballads and laments performed by Janusz Grzesz with Teatr Jednego Rapsoda. Free morning to needlepoint rest and read. After lunch, visit Kurozwęki Palace and the nearby Rytwiany Monastery. 7:00 p.m. Traditional Polish Barbeque and party. After breakfast at Sichów, transportation will return guests to Krakow. 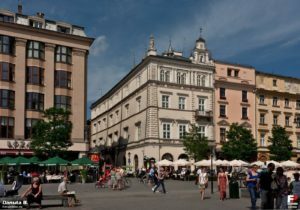 KRAKOW: Includes all transportation, hotel accommodation, breakfast, two dinners, entrance to sites (including the Wawel Castle), wine and cheese reception upon arrival, evening piano concert, and afternoon tea at the Popiel Mansion (15th Century Palazzo). SICHOW: Includes all meals plus transportation, hotel accommodation, entertainment, and entrance to sites. A deposit of $1,000 USD is due upon registration. The remainder is due on August 31, 2018. Early registration is encouraged as we can only accommodate twelve guests.